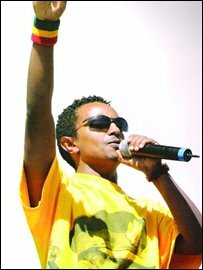 Ethiopia's most popular pop singer, Teddy Afro, has pleaded not guilty to causing the death of a young man in a hit and run incident 18 months ago. Thousands of young people mounted an impromptu protest after the High Court hearing, running through the streets, shouting, "Teddy is innocent". Unauthorised demonstrations are almost unheard of in Ethiopia and there was a heavy paramilitary police presence. At a previous hearing, the noise of his fans almost drowned out proceedings. This time the case was moved to a building at the back of the court area, well away from the crowd.